The idea of this Blog Hop is to choose a different designer each month and do a post focusing on a piece of their work you have stitched on during the month. The first month I focused on three very well-known designers; Nora Corbett (AKA Mirabilia), Joan Elliott and Teresa Wentzler. For the rest of the year I am going to concentrate on less well-known designers in the hope of spreading their fame across the Blogosphere. 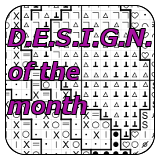 The hosts of D.E.S.I.G.N ask us to answer a few questions on our chosen designer. 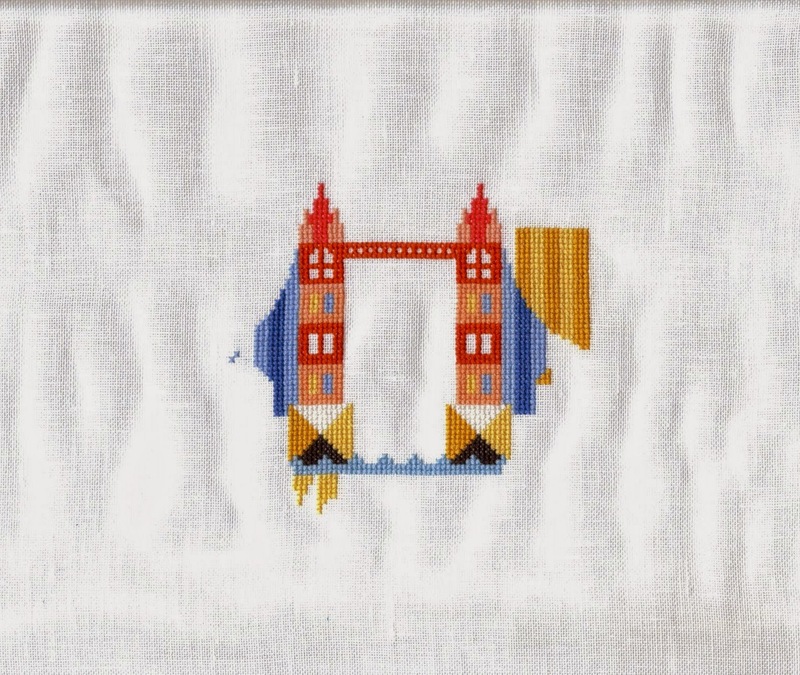 This week I stitched the blue and yellow under the bridge and the yellow for Big Ben's tower. No, this is my first Satsuma Street design. Yes! I have already got two more in the City series - Paris and Italy (yes, I know Italy is a country not a city!) 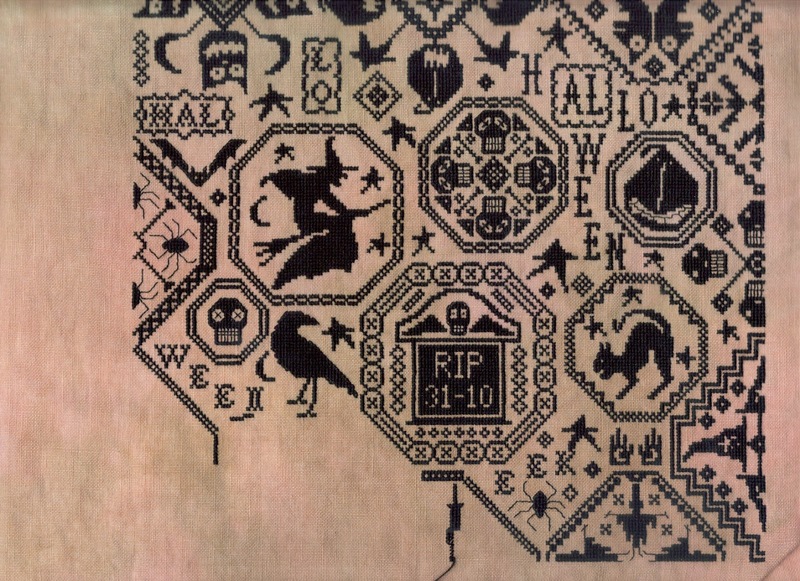 and I also bought Cross Stitch Crazy this month because it features an interview with Jody and three city charts, smaller ones this time and stitched on black. These will look great with the larger city designs. My plan is to stitch all the European ones first then move onto the rest of the world. I love the bright blocks of colour using only whole stitches which make them super quick to stitch. 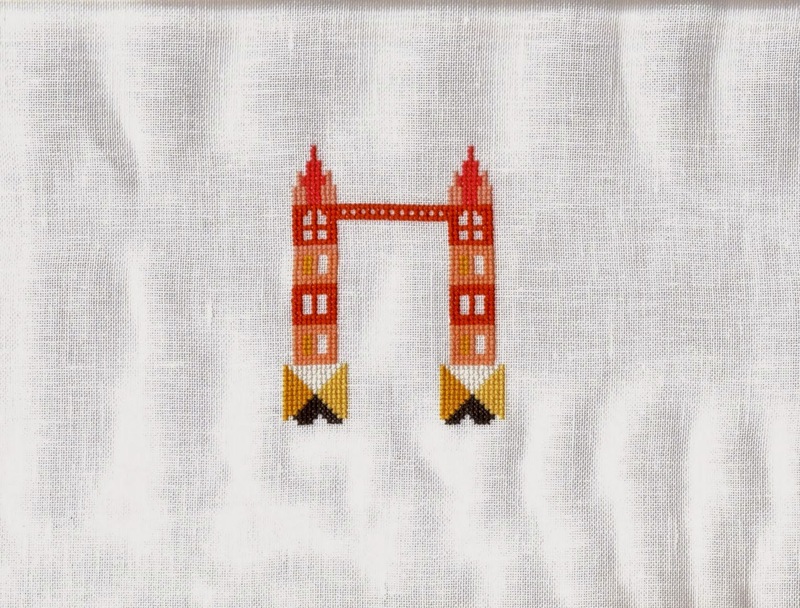 I chose London as the first one to stitch because this is the city I am most familiar with. Several of my family have lived there and we visit as often as we can. We love to do the tourist thing! As I mentioned before, Jody only uses whole stitches, she also rarely uses backstitch relying on the contrast between her colours to outline the various elements on the design. I love the way she uses bright and outrageous colours for the usually grey buildings. It would be so much fun to sneak out and paint the city in these colours for real! There are interviews with Jody here and here, she also has a blog here. One of the things she mentions in the interview is "I make sure that every single thing I put out in the world, whether it’s an Instagram image or a Facebook post, is consistent with my brand. From my choice of fonts to photo backdrops — even down to the choice of shirt I wear in a photograph for a magazine — I aim to keep a consistent look. " I found this fascinating because you can really notice it on her blog and her shop. This is very similar to a designer called Helen Philipps, everything she does has the same vibe and feel including her blog. She focuses on fresh pastel colours whereas Jody goes for the brights! Even their names seem to reflect their different styles. Finally, I have put together another little Pie chart of my stitching this month, just for fun! Because I have been focusing on my SOS piece I haven't stitched the March Ornie yet. But I have six days left this month so there's plenty of time! I have worked four out of five days so far this week so my stitching time is waaaaaaay down on usual. I didn't even pick up Satsuma Street last night so I am planning on dedicating Thursday to that one this week. The good news is that with the Easter holidays coming up I only have one day of work between now and the 15th April! So expect some good picture-filled posts next month. 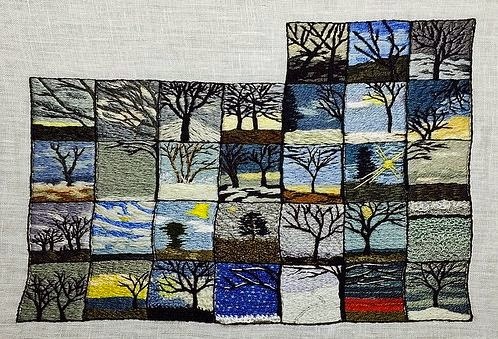 The artist embroiders one square every day inspired by the weather that day. I have seen scarfs with one row knitted every day in a colour relating to the temperature but never anything quite like this! Each block is only 1.25 inch square but so detailed. I love it! I am looking forward to seeing how this progresses through the Summer into Autumn. The brown flower in the top right was just so addictive, I stitched all of that motif on Friday and then half the bird motif on the other two days. It's interesting that as you stitch you can see where the original would have been joined up but Marsha has charted it as it looks now complete with the worn away gaps where threads would have been. This is particularly noticeable in the stems, vines and leaves. The Scarlet Letter Year Group are planning a Summer Outing this year to the Manor House of Micheal and Elizabeth Feller in the Cotswolds. If anyone would care to join us, please let me know. There are two trips planned, one on 26th August and one in July (date to be advised). The house will be open throughout the summer if you want to visit with your own group too. One hundred years ago, authors and other storytellers thought we'd have flying cars and apartments on Mars by now. How do you think the world will look 100 years from now? How long might it take for the future to really look like "the future" and why? I read a lot of Science Fiction and in many ways we are living in the Future they predicted. Although we don't have the flying cars yet we are looking at driverless cars now. If you have read The Hitchhiker's Guide to the Galaxy you will recognise the guide itself as an e-Reader. How many of you are reading this on an e-Reader or iPad? We have voice-activated computers, touchscreen computers and even eye-gaze computers for tetraplegic people. Remember the communicators in Captain Kirk's Star Trek? I specifically bought a clam-shell mobile phone so I could snap it shut and say "Kirk out" at the end of conversations! Only in my head obviously! So what will the future hold? Manned missions to Mars are being planned so we may have a small colony there. Technology will continue to make huge advances, especially in the medical fields. There is so much they can do to help people (with the money to pay) now it would be good to see it spread to helping everyone. Bill Gates' vaccination program is an example of a wealthy person using their money for the greater good. I'd also like to see more tolerance for people; we have slowly been moving towards greater acceptance of anyone who is not a healthy white heterosexual man but with the rise of the far right political parties this is being eroded far too rapidly. Maybe we will go backwards and become more interested in the handmade and bespoke? After all, look at the rise of "shabby chic" and DIY. I am sure cross stitch will still be as popular in 100 years as it is now. Maybe some of my younger followers will still be alive and blogging about it all! One of the issues with technology is how quickly it becomes obsolete. Who has a cupboard full of VHS tapes at home? Who has a loft full of vinyl? Who has lost their early blog posts because that platform is no longer supported? What about all those downloaded photos and charts? Do you diligently back them up and load them onto your new PC every time you change it? Hope you're not still using floppy disks for that purpose? One thing which won't change is that children will pick it all up much more quickly than adults will! I look at the way my son who cannot even read can find his way around the internet to find his favourite clips and games. He managed to flip the PC screen display 90 degrees the other day and was then trying to turn the monitor screen so he could see it properly! I had to Google to find out how to switch it back (Ctrl, Alt and a directional arrow in case you have a child who does this sort of thing too). Finally, Jocondine has published the answer to the first clue in her Journey Around France. She will be putting up the next clue on Wednesday so if you enjoy a puzzle with a needlework theme, do pop over and test your brain. The clues really are very well thought out and very educational too! So what did I buy? The white Jobelan was for the SOS project above. The Needleprint books and charts were very naughty purchases which I should have resisted. 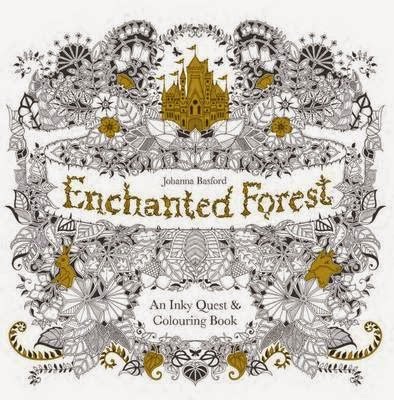 Jacqui is selling off her entire collection of books and charts it seems and I just couldn't stop myself! and these 10 charts for £12 less £2.80 postage BUT I am only keeping 3 of them for me and the rest will be giveaway prizes so I'm only counting the price of 3 of them in my SFS total. I am left with a mere £7 and some pence so I will have to be good this next month. And what have I been stitching from my stash? I finished the tombstone motif. You may notice my date is stitched the correct way ie 31st day of the 10th month and not the charted American back-to-front way! I also added EEK and a spider. The end is in sight for this piece. 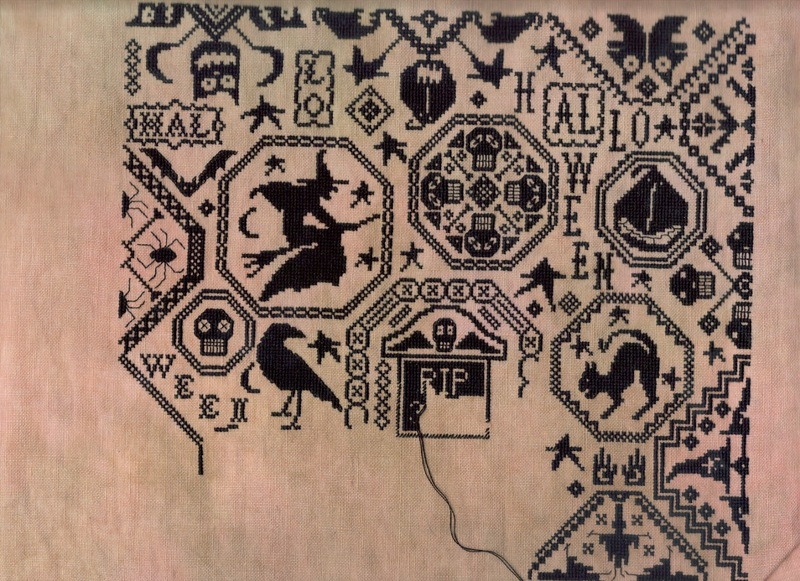 The bottom motif is going to be a pair of witch's boots. 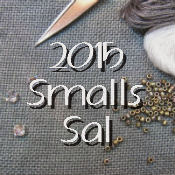 This next piece is my Tuesday SAL with Linda and Kate for the Satsuma Street Pretty Little Cities designs. 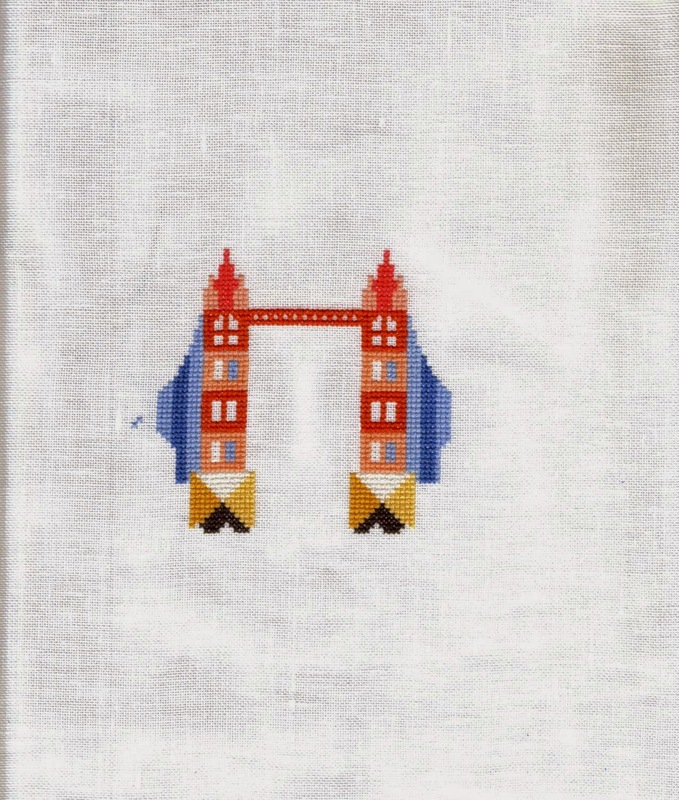 This week I stitched the blue on either side of Tower Bridge, filled in the blue windows and frogged the tan windows from last week because they didn't look right with the pink. 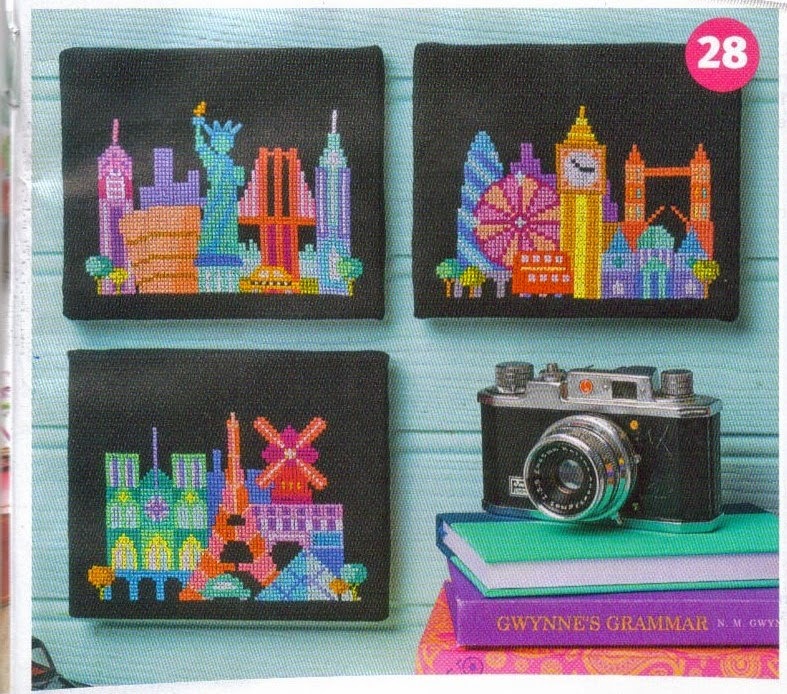 Satsum Street will be featuring in this month's Cross Stitch Crazy magazine too, so watch out for that, 3 different cityscapes on black fabric. If you enjoy a puzzle or an enigma you really should visit Jocondine's blog. She is taking us on a mystery tour around France with various clues relating to towns with a needlework connection! There will be clues posted each Wednesday and Friday with the answer being revealed on the Sunday. Finally, thanks to everyone who has linked up so far for March's Gifted Gorgeousness. The link up post will stay open until the end of each month and the sign-up page will be open until the 15th December. So don't worry if you are late to the party, there is still plenty of time to join in. 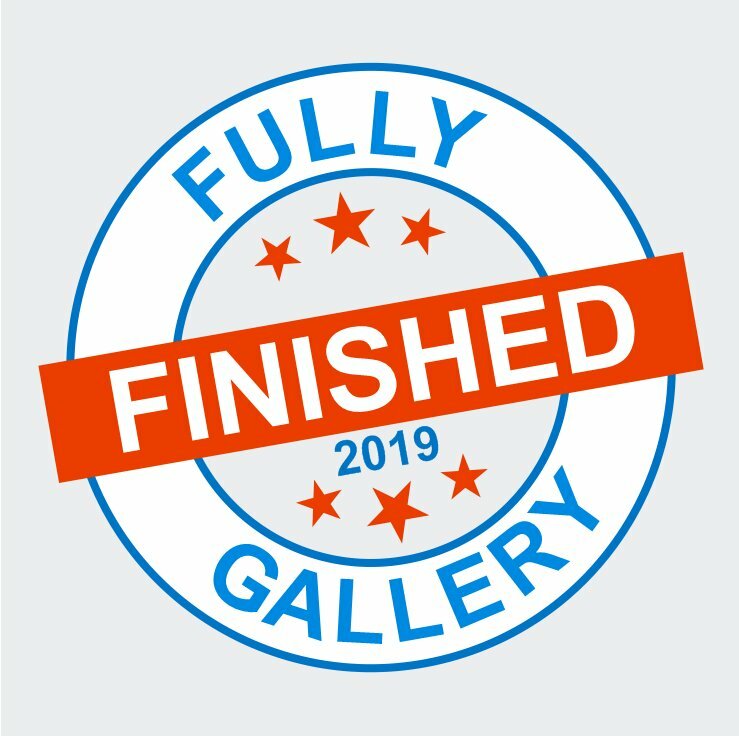 And now over to you - Here is the place for you to link up so we can see what Gifted Gorgeousness you have been stitching so far this year. Please use your name or your blog name in the field NOT the words "March Update" so I can easily see who has linked up this month. Last month the very Generous Gillie Gave a Gifted Gorgeousness Giveaway of a Primitive Needle chart. Lots of you entered the draw and Clare was the lucky winner. I told Gillie how many people had entered and she used the Random Number World Traveller to pick a number. Then I worked out who was that number! The chart should be well on it's way to Clare now. There will be another GGG next month to celebrate my Blogaversary and then a draw sponsored by one of my lovely followers in May. Can you feel the love? Finally, don't forget the Easter Treasure Hunt Blog Hop. If you would like to be a Picture Poster please email me. 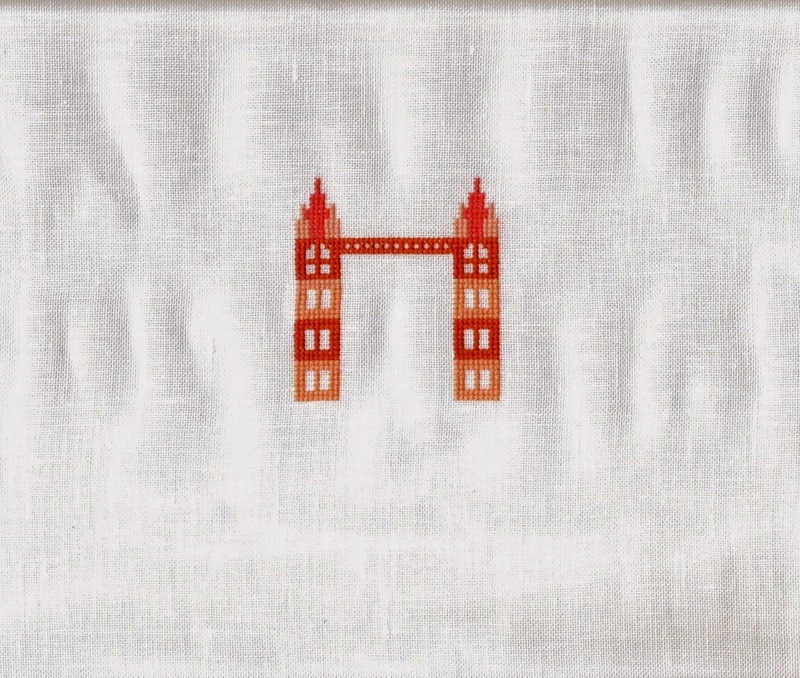 This week I stitched the triangular blocks at the base of the towers of Tower Bridge and filled in some windows. It's very addictive and I want to carry on beyond the one day a week. I guess this is why I am not a daily rotator! Luckily I have another addictive piece I can work on each day. Mostly because there is a deadline of the end of the month. I can't fit it all on the scanner! I am stitching this on 28count white Jobelan using Anchor threads. So far we have Violet, Indigo and Blue, moving on to Green next. I will be listing all the acronyms on my Happy Dance blog post when I have finished but if you are interested now please feel free to ask. Finally, I am taking names for the Easter Treasure Hunt Blog Hop. If you would like to be part of this as a picture poster please email me and I will add you to the list. All you have to do is post a photo of something you have stitched or otherwise crafted on an Easter/Spring theme along with a letter I will allocate you. 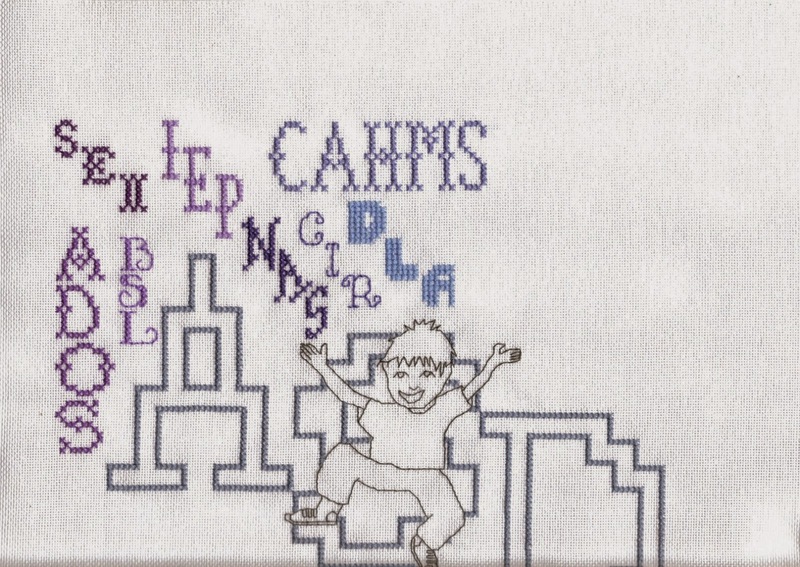 The letters will spell out a seasonal phrase when people hop round in the right order. If you prefer an anagram challenge please hop round in a random order! First of all, it's nearly time for the Easter Blog Hoppity Hop! Taking place over the Easter weekend each participant will be allocated a letter of the alphabet which they must post along with a nice Easter or Spring themed stitched photo. In recognition of the varied talents of my followers I think you can also show any sewn, quilted or otherwise crafted Easter or Spring themed items. Everyone will then hoppity hop around like a little fluffy bunny and collect the letters which will spell out something seasonal. If you would like to be a picture poster then please drop me an email. 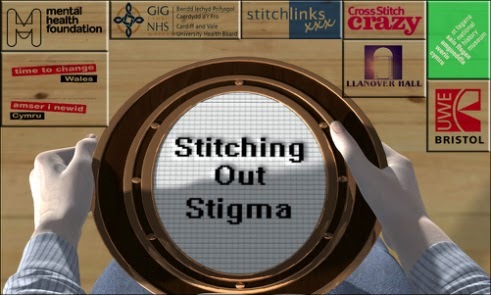 Anyway, Stitching Out Stigma is the brainchild of Natalie who has suffered mental health problems herself and wants to raise awareness by making a display of stitched squares on the theme. There are more details on the page. The initial deadline is the end of March but she wants to extend it to make a permanent display so there is still time to get involved. I like these kinds of projects, given a loose brief you can let your mind roam free. The theme I decided on was the Parents' Point of View. As those of you who have any experience of illness or disability will be aware you not only have to cope with your child's issues but also the professionals who will surround you and bombard you with acronyms and jargon. The most essential tool is The File (or The Filing Cabinet in the case of one friend who has three children with three different diagnoses!) and the front page of The File should contain the phones numbers and the acronym list for easy reference! I'm stitching on evenweave as although the website says aida it is just the English obsession with the damn fabric and Natalie confirmed that evenweave is fine. I stuck to 28 count so the proportions will be the same as everyone else. Now it's time for the fun part, choosing the colours! Why is yellow fabric so hard to photograph accurately? I stitched this on 25 count yellow evenweave which means it is rather large for an ornie so will be scrapbooked instead. The original intention was to stitch it over 1 until I realised that parts of it were already over 1 so that wouldn't work! Anchor 979 for the blue border. Random beads around the stars. Finally, I am planning to do a giveaway as part of Gifted Gorgeousness in April and this chart will be part of it along with anything else I actually manage to finish! March – If money – and time – were not limiters, what projects would be on your stitching bucket list? For me, the time question is the major factor! I don't have a lot of money to spend on my stitching habits (which is why I am so good at Stitch from Stash!) but I have so many magazines and downloaded freebies plus the lovely generousness which features in Gifted Gorgeousness I really don't feel too deprived that way! 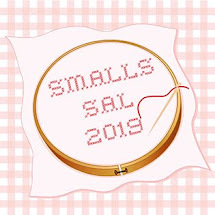 So, if time was unlimited, I would stitch almost every Mirabilia chart, all the Just Nans and Teresa Wenztlers in my stash, all the monthly series I see around the internet, all the different SALs and group projects. I would do more Round Robins and stitch a gift for everyone who enters my Blog Hops, stitched Birthday cards for all my followers and so on. Money-wise there are few projects I would actually spend a lot on, I am too cautious for that! But I saw this Cabinet of Curiousities and thought it was amazing. Until I saw the price! So that is one I would definitely go for. I would also love to attend more (any?) shows and retreats. This one is coming up soon and I would so love to be able to go - Fili Senza Tempo Formigine. I've also read about stitching cruises which sound amazing too. Another long-term goal is my Grand Tour of the World visiting all the my blogging friends! I'd buy one those Around The World Air Fares and stop off at various places, stay for a couple of days then move on to the next stitcher. I'd take a big piece of fabric and be my own personal Round Robin! Regular commenters may have noticed that I have switched to Comment Moderation. Don't worry, it's not a spam or stalker problem, it's a Yahoo issue. I noticed that people with Yahoo accounts can leave comments but I don't get the email to let me know and to reply to. I do like to reply to commenters so by moderating comments I get to see all the comments first and can respond to them all. Finally, we are approaching Easter, the weekend 3rd - 6th April. I will be hosting my Annual Easter Treasure Hunt again. Each participant posts a picture of something stitched on an Easter or Spring theme along with a letter I allocate to them. Over the Easter Weekend everyone hops around like a bunny, finds the Mystery Phrase the letters spell out and reports back here with it. Prizes for the lucky winners chosen at random. If you'd like to be a Picture Poster please drop me an email. Here is the link to last year's Treasure Hunt if you are wondering how it all works - Easter-treasure-hunt-blog-hop 2014. 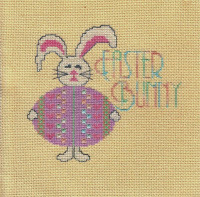 There are also lots of Easter and Spring themed freebies on my linked page at the top of the blog. I have checked the links but if any don't work, please let me know. It's been said that to be happy, you have to live in the moment. Do you agree with that statement? Why or why not? How well do you think you live in the moment and why do you believe that? "Living in the moment" is very much the philosophy of this year, Mindfulness is the "buzzword" with many new books being published on the subject. It's all to do with savouring the here-and-now instead of wishing your life away hurrying to be in the future or living in the past dwelling on past mistakes or past happiness and not appreciating what you have right now. The idea being that as you colour in the gorgeous pictures you are focusing on creating something lovely and achieving "flow" through that activity. What is "flow"? Most of us will recognise that state from our stitching (or knitting/crochet/crafting) but we probably call it the "Just One More Stitch" Syndrome! So back to Becca's question - I would say that I am indeed very happy when I am in a state of flow with my stitching. I am naturally a planner, a worrier, an over-thinker, I plot out difficult conversations in my head (usually when I am supposed to be going to sleep!). 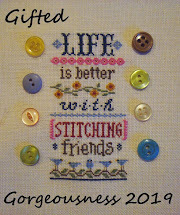 Having my stitching and my blog does at least give me something positive to focus those thoughts on. That's why I am always planning Blog Hops! 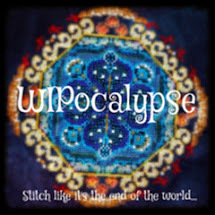 Ironically, my stitching is one area of life I do not worry about; I stitch what I want, when I want and so what if there is a big pile of WIPs and unstarted projects? Their time will come, it just gives me choice. I do get a lot of pleasure out of looking back through my blog and through my life. I can clearly remember being the Large Boy's age (I am blessed with a highly retentive memory for experiences) and enjoy thinking about what I was doing when I was 12. Was life better then? People look at the past through rose-tinted glasses, my husband is always moaning that the boys don't play out like we used to. But that's because there is so much more available to them in organised activities and in home entertainment. The Large Boy's friends have a huge range of sporting and recreational groups they can go to, not to mention the room full of toys, Lego and computer games. Their parents have much more disposable income than our's did. Probably because both parents tend to work now. My son has definitely seen less bullying, less poverty, less violence, less hunger and worry than my generation did. His worries and concerns, and those of his peers, are listened to and taken into consideration. OK, it's not perfect and there are still problems for many children but there is not the systematic bullying we experienced and were powerless to prevent. As he gets older, the Internet will become more of an issue but on the reverse side, he will be able to make contact with more like-minded people than he could ever meet in our small town. Maybe even start his own blog! I am conscious that he is on the cusp of teenagehood and will change soon. Harry Enfield has a brilliant sketch on this subject - Kevin Becomes a Teenager. So I am trying to live in the moment and enjoy the days where he is happy to cuddle up on the sofa and watch a film with his Mum. Yesterday's choice was Jack Black's School of Rock. Very funny film. And while we were watching, I was stitching! I completed On The Beach by Madame Chantilly. Here it is in all it's glory followed by a few close-ups. The fabric is especially dyed by Kate from Sparklies. I made several colour changes, the blues are 798/799/800, the starfish are 950 and the shell is 842. The dark tips to the seagulls are 3799, the charted black was just too harsh. Albert is my cousin's baby. Yes, old man names are back in fashion! I can't wait to get this framed and to go visit them to present it in person.